Individuals and businesses have many choices when it comes to insurance products and services. How do you know what the best options are for you or your company? The answer is Robbins & Associates Insurance Agency, Inc. We align clients with the proper insurance company for their individual needs. We represent the best insurance companies available to provide our clients with exceptional coverage for reasonable costs. Established in 1997 by Gene and Jo Robbins, our company has quickly grown into a full service insurance agency. Currently, Robbins & Associates Insurance Agency, Inc. serves the insurance needs of hundreds of individuals, families and businesses throughout North and South Carolina. With more than 150 years of combined experience, the agents at Robbins and Associates know how to handle the most complicated insurance issues and are ready to service accounts of all sizes. 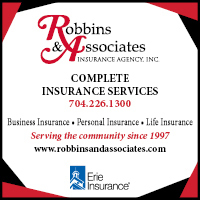 Robbins & Associates Insurance Agency, Inc. is a firm of proven professionals and caring, conscientious people; the kind of people you can depend on. We are committed to a high standard of excellence in all that we do, and establishing a firm relationship of mutual trust and service with each of our clients. We do not work for an insurance company; we work for you. We work on your side when you have a loss and follow through to see that you get fair, prompt treatment. From Hwy 74/Roosevelt Blvd in Monroe, to South onto the Skyway Drive Exit. Left onto Church St in Downtown Monroe, NC.